Using the tip of a pasty brush, grease gummy molds with melted coconut oil. Pour 1/4 cup of elderberry into bottom of a large mixing bowl. Sprinkle gelatin over top of surface and allow to bloom for 5 minutes. Pour 1/4 cup of VERY HOT water (but not boiling) into bowl and whisk quickly until gelatin is completely dissolved. Then pour in remaining 1/4 cup of elderberry syrup. Taste and adjust for sweetness with optional honey. Whisk again until completely incorporated. 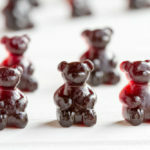 Pour mixture into gummy bear molds. Most come with a special dropper to make this process easier. Place into refrigerator until set- at least 2 hours. Store gummy bears in airtight glass jar in fridge. If you don’t have silicone gummy bear molds, you can pour mixture into small glass baking dish and cut into desired size pieces once set.